I really like using HDR with Tone Mapping as a tool to create dramatic landscapes with interesting skies, yet still retaining detail in the ground. I've put together a video screencast introducing the concept of HDR, what it means and how you could use it. So the essence of a (potentially) great HDR landscape shot is an interesting sky, well composed image, a very still camera, and at least 3 photos taken at different exposure values, one just right, then two others at + or - 1 ev (or more). You can get a trial version of the Photomatix HDR software at hdrsoft. 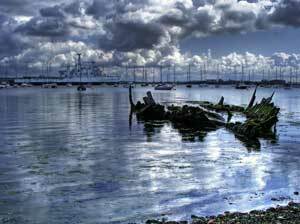 I've done quite a few HDR's now, and you can see them in my Flickr set on HDR. Thanks for reading / watching and enjoy your HDRing! The "Rule of Thirds" is a classic tool we can use to make our photographic compositions better, dividing the image we see in our view-finder with two vertical and two horizontal lines, then lining up or horizon with one of the horizontal lines, and putting our main subject at the intersection of two of the lines. 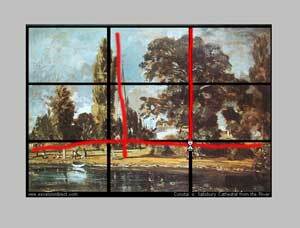 In this short video I try to illustrate how the Rule Of Thirds can be applied, looking at Landscape Paintings first, then showing you have I applied this rule when composing some of my own images. It may sound odd to talk about "Rules" in photography - but I believe that when you're learning a new skill its really important to have some strong, widely accepted guidelines that will help you develop, and the RoT (Rule of Thirds) is one such guideline. If you go out and practice taking images using the RoT's, your pictures will gain ballance and structure. When you look at painitings, or other peoples photographs that you like, see if you can see the artist applying the RoT's. You'll be amazed at how often they crop up. Don't be obsessed by getting your pics lined up exactly, follow the spirit of the rule to improve your composition. When thinking about which horizontal line to line up your horizon on, maybe ask yourself "what's more interesting? The sky or the ground?". Also people tend to look at photographs top to bottom, left to right, so think about using lines to draw the viewers eye in differently. I'm quite lucky that in my camera has a built in Rule of Thirds grid - press a button and I can easily line up horizons and subjects - have a look through your camera's instruction manual to see if it can too. I hope this screencast and article were useful, maybe you could post some of your "Rule of Thirds" inspired images to our Flickr Discussion / Photo Pool? I thought long and hard about importing the first few Photowalks I had done from one of my other sites, but then thought I'd be better off spending the time on new subects. If you'd like to see Photowalks 1 through 8, check out the Photography Section at sciuridae.co.uk. If you've just purchased a Fujifilm Finepix S5700 / S700 you may be interested in a Podcast I've done for a previous site - it's a learners Podcast that describes the features of this great little Bridge Camera and how to use it. Episode 1 - Image stabalisation, Natural Light, and program mode. Episode 2 - Apperture Priority and Shutter Priority mode. Next up will hopefully be image editing, image back up and sharing. So I broke my arm at the end of October '07, so I spent a week or so in hospital for an operation, then a long time recuperating. I read a lot of magazines and visited a lot of websites, and I was quite worried that I wouldn't really be able to do much with my arm in the long term, so I started to think about taking up Digital Photography as a hobby to replace my previous more active pass-times. Before I purchased the S5700 I'd only ever owned one Digital Camera, a Kodak EasyShare CX4230, a 2.0 Megapixel Point and Shoot, that could take ok shots in the right conditions. I had played with Photoshop Elements (ver 2.0!) with some of the images, but never got that serious about it. So when I started to look for a new digital camera, I didn't really know that much about the subject, but I knew about a few features I wanted. Long battery life, using ordinary batteries, not a model-specific pack, was first on my list. Next I wanted a big optical zoom, with an eye-piece view-finder. It had to be take video with sound, have a macro mode, and a tripod mount. My budget was about £100. Having some Amazon Gift Vouchers, that was going to be my shop of choice, so I started to hunt through the dozens of different models, checking the user-reviews, then cross-referencing these with other sites. The Fujifilm Finepix S5700 immediately stood out - 10x Optical Zoom, runs off 4 AA's, eye-piece, Super-Macro, Tripod, Video, and it was on sale for £106! I had found my Christmas Present! Apologies for the video and sound quality, but it should give you an idea about the size and some of the functions of the S5700. I can honestly say that the capabilities of the S5700 have amazed me. Ok, it's a point-and-shoot sensor in a posh body and lens, so you're not going to get dSLR quality straight out of it, but believe me when I say that this camera has almost all the controls a Digital Single Lens Reflex Camera would have. You can use the Fuji in Auto mode, where the camera does all the thinking for you, or Programme, Scene Position, Aperture / Shutter Priority, Movie and Full Manual. So if you're interested in taking up Photography seriously, but want to start off on a budget, if you learn all the features of the S5700, you'll know exactly how to get the best out of a true dSLR. What am I talking about? Well, we've got auto-bracketing, various focusing modes, spot, average and multi photometry. Auto, preset or custom white balance. Manual focus. The list goes on - just work your way through the manual (which is excellent) and go out and shoot to learn. Technical stuff, the S5700 is 7.0 Megapixels, 10 times Optical Zoom, takes SD cards, takes video at up to 640 x 480 at 30 frames per second. It runs off four AA batteries, has a 46mm lens thread (for filters) and doesn't come with a camera bag. To gauge picture quality, take a look at my Gallery. Remember that these images have been edited - so contrast has been increased, colours improved, etc, the original images are a lot "flatter", but this goes for all budget digital cameras. The best shots are achieved around dusk or evening, where little editing is needed, and remember that because the S5700 can Auto-Bracket, HDR images are possible too. Very few gadgets really impress me. Yes, the S5700 has shortcomings. Occasional purple fringing, and I worry about the build-quality of the plastic battery and sd card covers, but I assure you that I will not be changing my S5700 until I can afford a very expensive dSLR with very good lenses - the Fujifilm is that good.